Jay Green (left) trains with Curtis Pyle. Earlier this year, Just Let Me Do It awarded its first franchise to Jay and Chrystal Green in Albuquerque, New Mexico. We sat down with Jay to learn more about him and his decision to join the Just Let Me Do It Family. 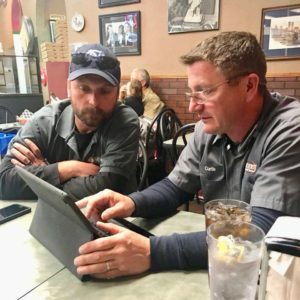 Meet our newest franchisee – Jay Green. JLMDI – Hi, Jay. First, I would like to welcome you to the Just Let Me Do It Franchise family. Can you tell us a little about your background? Jay Green (JG) – Thanks so much. Before buying a Just Let Me Do It franchise, I worked with the City of Albuquerque Sanitation Department. I’ve never owned a franchise before, but I do have experience fixing things. JLMDI – What made you choose the Just Let Me Do It Franchise? JG – To be honest, I was just looking for something different. I’ve worked for the City of Albuquerque for a long time, and I really wanted to find something that my wife and I could do together. I love that Just Let Me Do It only handles commercial work, and that was the most appealing aspect over other handyman franchise opportunities. JLMDI – Why did you choose a franchise model over starting a business on your own? JG – At first, I considering starting my own business, but I soon learned that the franchise route was the best way to go for me and my family. Starting a business is tough, and what I love about owning a franchise is the support you get. Just Let Me Do It has so many clients that are national retail chains and restaurants, so I really didn’t have to worry about going out and finding business. From the beginning, we had work, and it’s only getting busier by the day. Another great thing about owning a Just Let Me Do It Franchise is that they take care of all the service calls and routing, as well as the back-office billing; which means I don’t have to hire a receptionist or bookkeeper. JLMDI – How was training, and how did it prepare you for success? JG – While I am a pretty handy guy, I’ve never worked in the construction industry. I was a little nervous at first, but training went extremely well. Curtis (Pyle) has been doing this for so long, and he really made me feel comfortable and I learned a lot. The toughest part for me was learning how to estimate jobs, but now I’m pretty good at it, thanks to Curtis’ help. One thing that’s great about Just Let Me Do It is the on-going support. Whenever I have a question, I can always FaceTime with Curtis, and he can fix anything–even if he isn’t there with you. JLMDI – Would you recommend owning a Just Let Me Do It franchise to others, and why? JG – Yes, I would absolutely recommend owning a Just Let Me Do It franchise to anyone. I think for all the reasons I’ve already mentioned, but more than that, I get to do something different everyday, while making good money doing it. It doesn’t get any better than that! JLMDI – You are based in Albuquerque, but can you tell us what other areas you service? JG – Sure, we service all of Albuquerque, as well as Santa Fe, Laguna, Bernalillo, Edgewood, and the surrounding areas. JLMDI – Jay, thanks for your time, and again, welcome to the Just Let Me Do It family! JG – My pleasure. I look forward to a long and successful career and investment as a Just Let Me Do It franchisee. Just Let Me Do It is a full-service, commercial maintenance, repair and remodeling franchise company with locations in Arizona, New Mexico and North Carolina. Just Let Me Do It prides itself on being a “one-call-does-it-all” service provider, specializing in servicing retail stores and restaurants to the highest standards. 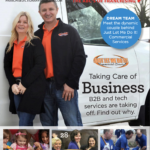 Visit the franchise section on our website to learn more about the Just Let Me Do It Commercial Services Franchise Opportunity and request a Franchise Kit today!